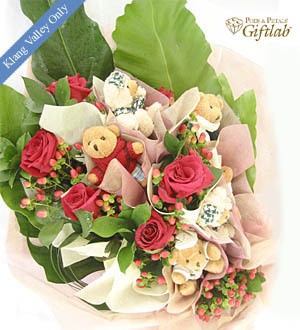 Flower Bouquet to convey your kind sentiments. Purchase of our Gift & Flowers come with a Complimentary Message Card, a personalized message from you to the recipient. Call our Customer Service at 03-78830233 / +6012-6915200 or email sales@gift-lab.com should you require assistance. More Flowers & Gifts ideas with our Affordable Posy Flowers (Below RM100), Live Orchids, Chocolates & Flowers, Cakes, Fruits Basket , Good Wishes Hamper, Perfume For Him and Perfume For Her.